Engine serviced June 2018 and unused since. 212 litre fuel tank plus a 20 litre auxiliary tank. Hallmark roller galvanised single axle trailer included. The V-Type Chase RIB is a stunning looking boat, with excellent attention to detail throughout. The boat has the speed to match its great looks and tops out at around 50+ mph. This particular V-Type RIB looks to be in good order and to have been well maintained. We have just carried out a full service on the engine and fitted new Yamaha gauges. If you're looking for a quick RIB with plenty of space for everybody at a price that doesn't break the bank then look no further! 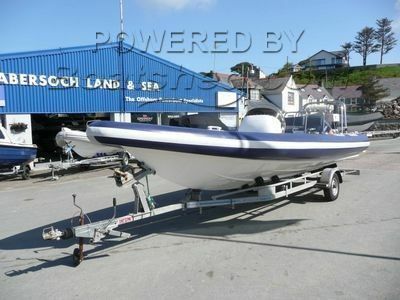 This V-type 7.2M Chase Rib has been personally photographed and viewed by Chris Tindall of Boatshed North Wales. Click here for contact details.